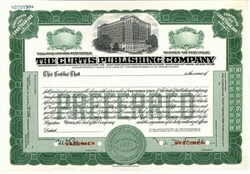 Beautifully engraved Specimen Certificate from the Curtis Publishing Company printed in the 1920's. This historic document was printed by the Security Banknote Company and has an ornate border around it with a vignette of the compay's headquarters with trolly cars in front. This item has the printed signatures of the company's officers and is over 72 years old. Arriving in Philadelphia in 1876 after having successfully published The People's Lodge for six years in Boston, Cyrus H.K Curtis founded the Tribune and Farmer. The women's column, under the editorial direction of his wife Louise Knapp Curtis, became so successful that in 1883 it expanded to become Ladies' Home Journal. Guided by the editorial genius of Edward W. Bok, Ladies' Home Journal rapidly became the leading magazine of its type reaching a circulation of more than one million copies in ten years. In 1890 Curtis formed the Curtis Publishing Company, and in 1897 purchased The Saturday Evening Post for $1,000. Its circulation was under 2,300 copies a week, and its advertising income for the year was less than $7,000. Under Curtis and his inspired choice of George Horace Lorimer as editor, The Saturday Evening Post was completely reborn. Supported by generous financial backing from the profits of The Ladies Home Journal, The Saturday Evening Post became one of the outstanding successes in periodical history with circulation reaching one million copies a week in 1909; two million in 1913; three million in 1937; four million in 1949; nearing five million in 1954; and setting an all-time high of seven million copies 1961. In 1911, Curtis acquired Country Gentleman, which also became a profitable addition. Jack and Jill for Children and Holiday were launched in 1938 and 1946, respectively. These five publications formed the nucleus of one of most influential and profitable publishing ventures of the early twentieth century. Arranging for the distribution of the weekly, The Saturday Evening Post and the other publications with manually operated comptometers and adding machines was a massive undertaking. Developing a multi-layered field organization and engaging the services of many thousands of adults and "boy salesmen," Curtis succeeded in having copies of The Saturday Evening Post delivered to every town and hamlet in the United States on Wednesday of each week. Curtis' first publishing clients for its distribution services were Bantam Books, launched with 20 titles in December, 1945; and Wonder Books, which came to Curtis in 1949. Wonder Books was owned by Random House and was subsequently acquired by a joint venture company comprised of Curtis and Grosset & Dunlap. 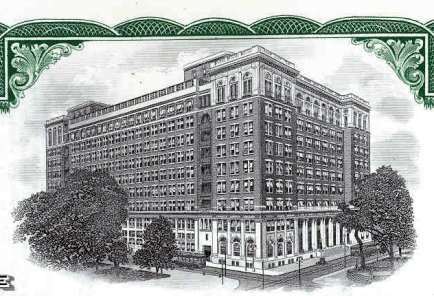 The Curtis building on Independence Square is, to this day, a notable Philadelphia landmark. The Curtis Publishing Company circulation department became a separate subsidiary company, The Curtis Circulation Company, in October 1946. The Curtis Circulation Company continues to be an organization whose expertise is still widely recognized today and whose market share has grown from 6% in 1982 to over 25% today. Norman Percevel Rockwell was born February 3, 1894 at 2 A.M. in the morning in the back bedroom of a brownstone at 103rd Street and Amsterdam Ave., in New York City. By 1899, Norman was showing his artistic talent by drawing pictures of battleships after attending a parade for Admiral Dewey. His family moved to Mamaroneck, New York in 1903, and he was raised in a series of boarding houses. About 1908, in his early high school years, young Rockwell decided to become an illustrator. He commuted to the Chase School of Fine art, and by age 15, quit high school and enrolled in the National Academy School in New York. Rockwell painted a total of 400 covers for the Post. He was one of the most talented and prolific painters to hail from the US in this the last 100 years. His early illustrations were sold to St. Nicholas magazine and other publications for the children. Rockwell sold his first cover to the Curtis Publishing Company in 1916. The pipe smoking thin artist worked for over 60 years painting the common people of all walks of life. He worked 7 days a week, with a half-day off for Christmas, loved his work, and was always trying to improve each painting. Among the famous people who sat for portraits by Rockwell were Nassar of Egypt, Nehru of India, President Eisenhower, President Johnson and President Kennedy. Rockwell�s personal contribution to the war effort in World War Two, was a series of four paintings, reproduced as posters by the government, and used as covers for the Post, entitled "the Four Freedoms." The posters symbolized the aims of this country during World War Two, and perhaps symbolized what this nation was founded on better than any man made object since the Declaration of Independence. The Four Freedoms series of paintings were inspired by the speech of President Franklin Roosevelt in a speech by the same name.